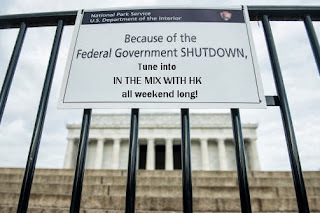 IN THE MIX WITH HK™: I'M GONNA SHUT IT DOWN! I'M GONNA SHUT IT DOWN! So let me get this right…the people who run our government don't have to go to work cause they can't agree on a spending bill. Yet, when all is said and done – after days and possibly weeks off they'll strike an agreement and pay themselves retroactively. Plus keep those amazing government health plans. Yeah that's right! And it's all paid for by you and me. Wouldn't it be great if you got paid to stay home when you couldn't agree with your co-workers! Wait…that's crazy…and exactly my point. Hmmm, PEOPLE – why do we continue to let this happen. Speak out and contact your politicians. In protest I'm gonna shut it down this weekend. But don't worry, that's a good thing! I'm gonna "Roar" with my latest remix of Katy Perry. We're gonna feel like "Royals" with Lorde and we'll console each other about our "Summertime Sadness" and impending "Sweater Weather". I'm hoping to make us all feel a little bit "Closer" and "I Wish" I could keep it going "All Night". There will be a point in the evening where you'll say to yourself "What Now" HK. Don't worry you're not going "Berzerk". The "Demons" in Washington will get this resolved and once again all will be "Safe and Sound". So tune in this weekend and find out what all the "Applause" is about. TWERK OR TREAT ON IN THE MIX WITH HK! 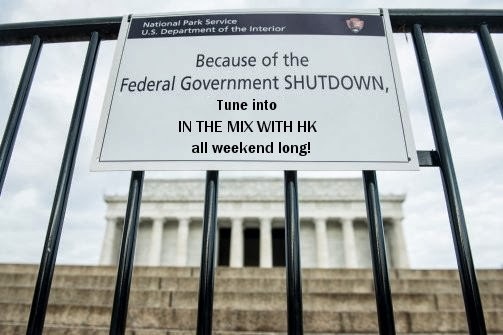 THIS WEEK IN THE MIX WITH HK!